Gazan body builders jovially struck poses after a workout, 2013. Credit: Tanya Habjouqa. Whenever you see reports from Palestine in the news, you expect conflict with Israel and a region at war. Military movement and acts of terror make the news. You don’t expect to laugh. To show a side of life that isn’t typically reported, Tanya Habjouqa met Palestinians in the West Bank, Gaza and East Jerusalem for her “Occupied Pleasures” photo series. “I want people to look and see the people who’ve been reduced to a complete stereotype. I wanted people to look and laugh and think,” she said during an interview with Slate Magazine. A Jordanian-born, Texas-raised photographer living in East Jerusalem, Habjouqa felt compelled to share another side of Palestinian life in part because it’s the experience of her Palestinian husband and two children. 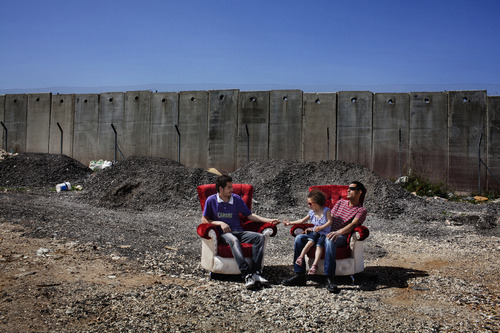 West Bank : Two furniture makers take a break in a pair of plush armchairs (of their creation) in the open-air in Hizma, against Israel’s 26-foot high Separation Wall. 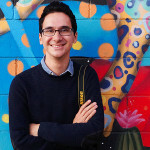 2013. Credit: Tanya Habjouga. “I really felt I needed to find another way to tell a story, not only just to make sense of it for myself but to make sense of it for how I’m going to present it to my children as well, since this is going to be their home too,” she told The New York Times Lens blog. A veteran visual storyteller, Habjouqa has covered gender, social and human rights issues in the Middle East for most of her career. She is a founding member of Rawiya, the first female Middle Eastern photo collective. 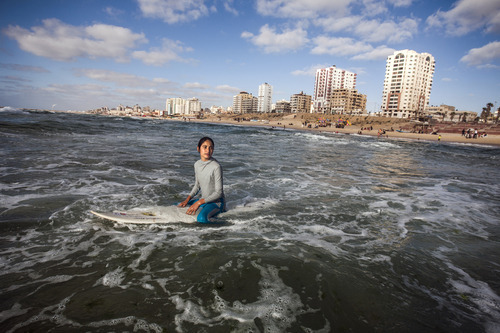 Sabah Abu Ghanim, 15 years old, Gaza City. Credit: Tanya Habjouqa. With support from FotoEvidence she launched a successful Kickstarter campaign last month to put “Occupied Pleasures” into book form. At the time this story was published the campaign had raised $34,000, exceeding an initial goal of $21,150. The campaign ends Wednesday. FotoEvidence has been behind several successful photo books and projects backed by the Kickstarter crowd, most recently Andrea Star Reese’s look at life inside tunnels below Harlem in New York City. Being Jordanian and living in the area helped her gain access but not everyone was immediately open with Habjouqa. To convince some photo subjects, Habjouqa carried with her some of the images that would be included in the series and explained the project’s intent. “There was certainly a hesitancy and certainly some distrust. With the ‘hyper narration’ that happens here, there’s also hyper political agenda, especially in this conflict. People have been grossly misrepresented,” she said. 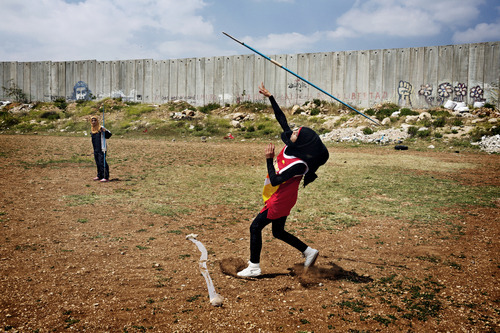 West Bank: Students from the Al-Quds University javelin team wrap up the last practice before summer vacation in the West Bank city of Abu Dis, next to the Israeli Separation Wall. 2013. Credit: Tanya Habjouqa. The “Occupied Pleasures” series was partially funded by the Magnum Foundation Emergency Fund in 2013, which helped distribute her work to traditional and new media outlets in collaboration with nonprofits and NGOs. The series won a World Press photo award last year. Following the Kickstarter campaign, Habjouqa hopes to make more copies of the book available and devote time to sharing the work in exhibitions, community centers and museums.